The anode material in almost all of today’s secondary lithium-ion batteries is graphite. In order to boost the energy density, we would love to replace the graphite by lithium metal. Many people work on this goal. Unfortunately, the lithium metal anode tends to form dendrites during electrochemical plating, eventually ending the battery life by an internal short-circuit. In our previous application note “Lithium metal dendrites: Pictures speak louder than words” we have presented a time-lapse video showing the lithium dendrite growth in a lithium metal battery using a graphite strip as the working electrode, and lithium metal as the counter electrode. We still own you the proof, that there are no dendrites when using a non-metal lithium source as the counter electrode. Here you go! Using our ECC-Opto-Std test cell, we have placed a strip of graphite next to a lithium iron phosphate (LFP) electrode having the shape of a semicircle. A glass fiber separator is pressed against this side-by-side assembly from below, so as to fill up the gap between the two electrodes. Different from our previous set-up, we additionally placed a lithium disc below the separator serving as the reference electrode. Again, the microscope “looks” through the sapphire window onto the two active electrode layers. 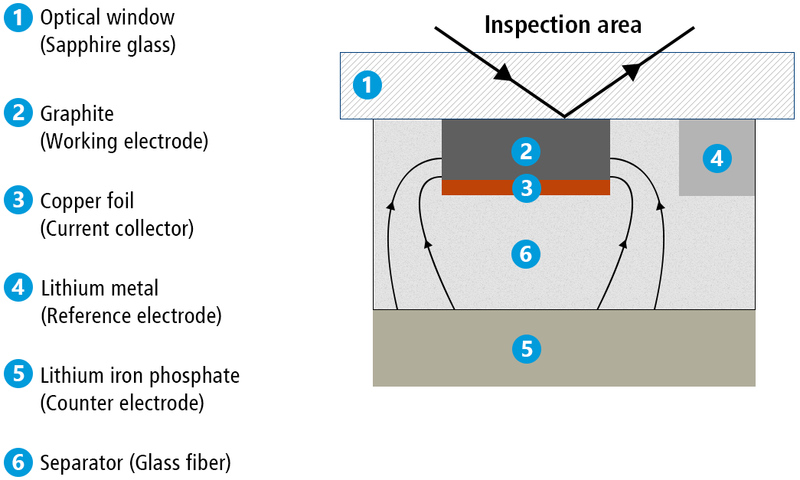 For the electrochemical cycle, the graphite strip is connected to the working electrode of the potentiostat, the LFP semicircle to the counter electrode, and the lithium metal disc to the reference electrode. The video shows how the color gradient evolves along the width of the graphite electrode during lithiation/ delithiation, while the corresponding process in the LFP electrode cannot be visually detected. 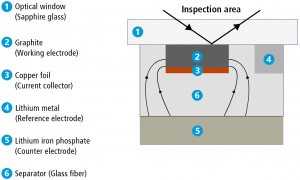 Using an additional reference electrode, the ECC-Opto-Std test cell allows visualization of the potential and Li-ion concentration gradient in lithium-ion anodes and cathodes. With a non-metallic counter electrode the life time of the set-up is no longer limited by dendrite growth. Li-ion is the answer! You may complain that, with a light microscope, we don’t see what is going on in the LFP cathode. Fortunately, the ECC-Opto-Std can easily be adapted to other techniques such as Raman or X-ray.